Dr. Oleg Levchenko P.P. Shirshov Institute of Oceanology, Moscow. Eastern Indian Ocean is characterized by numerous peculiar geological and geophysical phenomena and highly complex tectonics. Numerous unique geological features, such as volcanic intraplate aseismic rises (Ninetyeast Ridge, 85�E Ridge, Afanasy Nikitin seamount and others) as well as exclusive Intraplate Deformation Area to the south of India were aroused due to several critical reconstruction of plate kinematics after the breakup of Gondwanaland in the Early Cretaceous. Origin and evolution of all of them are generally enigmatic till now. 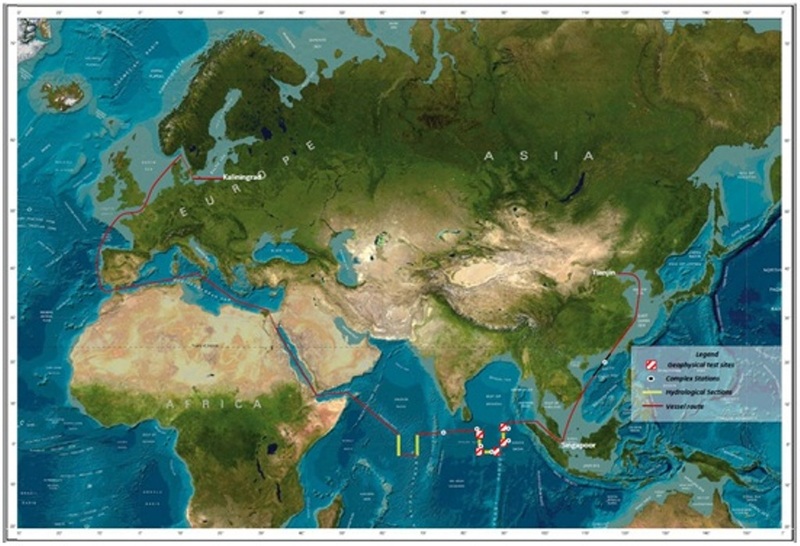 Origin of the deepest Indian Ocean Geoid Low m south of Sri Lanka is also not clearly known yet. The project study aims to understand the regional geologic structure and tectonics to understand the evolutionary process. The different approaches of analyses add to the understanding of the peculiarities of bottom topography, tectonics, faulted and folded deformations, anomalous geophysical fields and character of magmatism and geodynamics in the Eastern Indian Ocean. The main fundamental problem of the project within the framework of the specified problem is study of the Ninetyeast Ridge - the longest linear bathymetric and the most enigmatic feature in the Indian Ocean and a unique recent oceanic intraplate deformation zone characteristics including the highest oceanic intraplate seismicity and thermal flow. Structure and evolution of lithosphere of the Eastern Indian Ocean, which in respect to formation and history of development is one of the most uncertain and debatable regions of World Ocean. Studying of the crust/lithosphere peculiarities and analysis of geophysical fields near large volcanic aseismic ridges and rises in the Eastern Indian Ocean: generalizations of the geological-geophysical data near of the Ninetyeast Ridge, 85�E Ridge, Afanasy Nikitin Seamounts and others revealing of its nature. Syntheses of the seismic profiling data and determine sequence stratigraphy and their geochronology as age data are available. Recognition of ages of faults patterns shall be utilized in knowing crustal processes of the lithosphere and structure and propose constrains on ongoing tectonics within the Intraplate Deformation Zone south of Sri Lanka. Integrate geochronological and geophysical results for understanding of kinematics of the hotspot and intraplate deformation in the area since inception. The comparative analysis of geochemical features of basalts long-living mantle plums and hotspots which accompanied with break-up of Gondwana, and definition of their contribution in modern magmatism of the Eastern Indian Ocean for an establishment of the main stages of tectonic and magmatic evolution of the lithosphere. Though the most part of this territory settles down within the single Indo-Australian plate, its different sites differ sharply under geophysical and structural characteristics. A riddle there is a nature of the Ninetyeast Ridge occupying the central position inside the plate - one of the most extended (~5000 km) linear rise in the World Ocean. It divides the Central Indian Basin and Wharton Basin, which are characterized by different tectonics and lithosphere structure. The largest geoid low in the World Ocean as well as a unique recent oceanic intraplate deformation zone is located in the Central Indian Basin. For reconstruction of a history of development of the Eastern Indian Ocean, it is necessary to reveal structure and evolution of lithosphere as well as tectonics for its each feature and to explain all of them within the same geodynamic model.